China desperately is tossing the French government rather than tossing the German government? Comparison of the Sino-French and Sino-German relations, France is the first Western country to recognize China, but the Sino-French cooperation is more culture rather then trade which is between China and Germany. Sino-German trade accounted for a quarter of total trade between China and EU, bilateral trade between Sino-Germany exceeding 100 billion last year which is ahead of target scheduled in 2010 when trade volume being doubled. German and Chinese manufacturers rely the exports, while the financial crisis makes the two countries’ foundations of economy dramatically being affected. China's package to stimulate the economy covers four major areas, one of which is to carry out technical transformation of the technology. China needs Germany’s top technology and Germany needs China's market. The German scholars have pointed out that he sale of Maglev core technology implemented in Shanghai Maglev train project seems bring no gains to Germany. However, Germany have no choice because although Germany is possession of this core technology, the opposition voices stop this tech from being implemented in Germany. On the other hand, the Chinese government encourages enterprises to establish R & D and production base in Germany. That brings Germany much-needed job opportunities. For example, Sany Heavy Industry announced the investment of the almost 100 million euros which makes 1000 local jobs ready to offer. To China, Sino-French relations are not irreplaceable. Britain and Germany still can replace the role of France in the European Union. Especially in the past one and two years, the United Kingdom and China have developed a positive bilateral relation, which to some extent, down graded by closely intimate relations between Sino and France. However, Britain for the first time publicly declared to recognize China’s sovereignty over Tibet during the time when Sino-French relations began to move to the edge of break up due to Tibet sovereignty issue which was climbed to climax in 2008 BeiJing Olympic Games . Just a few days ago, the British Ministry of Foreign Affairs in its latest policy paper says that during the next few years to promote relations with China is a "top priority." If from the perspective of global trade, France is dispensable considering the world has strong competitors to France ranging from nuclear power plants, large civil aircraft or high-speed railway. Particularly, German exports to China is actually four times higher than France. So for France, the France-China relations is irreplaceable. The Chinese government four trillion yuan economic stimulus plans make a push on the Shanghai maglev train line extension. The problem involved once again is put on the agenda. Germany's ThyssenKrupp Group is willing to sell part of maglev technology to China, but another maglev project partner, Siemens, is not willing to. 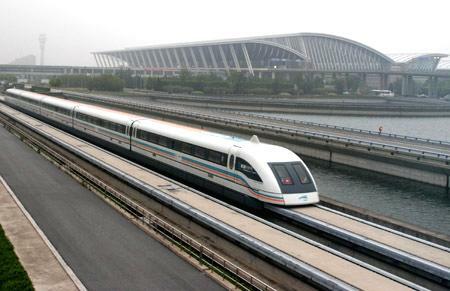 "Deutsche Welle" 22nd quoted the German "Handelsblatt" the report saying, "In order to bring Chinese people's interest, ThyssenKrupp Group is willing to sell part of maglev technology to China. ", It’s reported that "Thyssen ThyssenKrupp Group is responsible for magnetic levitation technology, the Siemens Group based in Munich, compared with the whole paragraph lines, is to provide electricity supply and a full set conduction and security technology. Siemens spokesman said, 'Our primary goal is and has been to retain in Siemens the core components of magnetic levitation technology. The railway technical experts explain that this Siemens technology, in principle, is similar with the German inter-city express train control systems. Therefore, Siemens does not want outsiders see their own cards. However, Siemens also hope the Chinese premier's visit to Berlin is to play an active role in promoting. Siemens said on Tuesday the Shanghai project on the Maglev is of strategic significance in terms of marketability of Maglev technology. It also said that if the magnetic levitation maks a breakthrough here, it will also be able to open up new possibilities in other regions. France is the first Western country to recognize China. However, the Sino-France relationship is not as good as before. I don't know what are your opinions about French president Sarkozy. Personally, I have no good impression on him. Post a Reply to: China desperately is tossing the French government rather than tossing the German government?